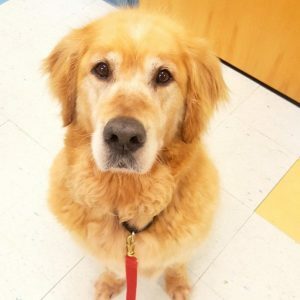 Adopt a Golden - Yankee Golden Retriever Rescue, Inc. Thank you for your interest in opening your heart and home to a YGRR dog! Demonstrate an ability and commitment to provide proper care, exercise and training for the lifetime of a large dog. Reside in one of the six New England states. If there are children in the home they must be 6 years of age and over. Provide a physical (not electronic) fenced-in area large enough to safely exercise the dog. Appropriate Goldens may be placed in un-fenced homes. Commit to keeping the YGRR dog inside only (dog doors must be secured to prevent access to outdoors) when nobody is home. If the YGRR dog will have access to a swimming pool, the pool must have stairs to exit the pool and an ‘elephant proof’ cover which fits snugly to the pool edge. Due to our emphasis on safety, we take great care in matching only dogs who have a known history with young children in homes where they will have interactions with children under 10 years of age. Because of the high demand for these dogs and the low number of appropriate dogs we receive, we do not place dogs into families with children under 6 years of age. Additionally, families with children under the age of 10 will have a considerably longer waiting time. To satisfy YGRR’s fencing requirement the physical fence must be a minimum of 4′ high (5′ preferred), have a lockable gate, and ideally be directly accessible from the home. We recognize that there may be exceptional applicants without physical fencing. An experienced dog owner may petition for an exception to this policy. You must include a detailed summary of how you have kept past dogs and describe in detail your plans to exercise a dog. We will do a more extensive vet check while processing your application. First-time dog owners are considered on a case-by-case basis. Please understand before you apply that exemption requests to this safety requirement are carefully reviewed and your application may be denied at any point in the process. This is not a reflection on your ability to care for a dog, but is based upon our knowledge of the dogs who come into our program and over 30 years experience making successful matches. Residential facility (nursing home, halfway house, etc.). We appreciate that there are many wonderful homes that may not meet the criteria above and applaud their interest in a rescue dog. Due to the characteristics of the dogs that come into our program, and the number of Approved Applicants currently waiting for a YGRR dog, we wish to be clear about adhering to these criteria as we do not want to unnecessarily delay or frustrate applicants who would be waiting a very long time and might never find a match given their circumstances. Repeat adopters will be considered for exceptions on a case by case basis. Great dogs get adopted into great homes and live happily ever after! *There is a $25 non-refundable application processing fee to help cover our expenses. These fees help us meet the boarding and veterinary expenses incurred by our nonprofit organization, as our average expense per YGRR dog is greater than the adoption fee. Due to the fact that so many wonderful families want to rescue a dog, the waiting time to adopt a YGRR dog may be two years depending on your personal circumstances and flexibility. Homes with children, other dogs, and/or cats will generally experience the longest waiting times to find a compatible YGRR dog. Our dogs are placed into the best homes for them based upon their individual needs and personalities. We appreciate your patience and thank you for your generous wish to open your heart and home to a YGRR dog. IMPORTANT INFORMATION REGARDING INTERNATIONAL TRANSFER GOLDEN RETRIEVERS: Due to the high transport costs associated with our International rescue initiative, effective immediately there will be a $400.00 Transport Fee added to the normal Adoption Fee for an International Golden. This fee represents a small fraction of the expense YGRR incurs, but will hopefully help us to continue this program which has made so many dogs and adopters so very happy. **We rarely have young puppies available; for information on finding a reputable breeder, click here. We cannot accommodate drop-in visitors to our facility. Prospective adopters visit YGRR by appointment AFTER their adoption application has been approved. There is a $25 non-refundable adoption application processing fee to help cover our expenses. Upon completing the application, the adoption fee will be added to the shopping cart. You will need to process the transaction for your application to be considered. If more than one number separate them with commas. How did you learn about YGRR? Household Dogs: Breed, Age, Neutered/Spayed? If yes, how often and what ages? 5. How do your present dogs get along with other dogs? 17. I do not have a fenced in area, but I am willing to install one and I have obtained an estimate. Fences are required for most adoptions. 18. Do you have a hidden fence? * Due to our emphasis on safety and the low percentage of Rescue Dogs who are suitable for this type of containment, only repeat adopters with YGRR will be considered for hidden fences. Repeat adopters must have successfully used an approved hidden fence system with a previous YGRR dog at the same address. Additional conditions will apply for repeat adopters to be considered for this fencing exemption. 19. Do you have a pool? Does your pool have stairs and an elephant proof cover? 20. Do you have a second dwelling? Please be sure to include the necessary materials in order for us to evaluate your petition. 22. What Age do you prefer? Please not that we rarely have puppies. 23. Will you consider adopting a special needs Rescue Golden that requires medication for a permanent but controlled condition? Please read over the Terms of Adoption below. Cost The adoption fee for Rescue Dogs ranging in age from 8 weeks up to age 2 is $800. Rescue Dogs age 2 up to age 5 are $600. Rescue Dogs age 5 up to age 8 are $500. Rescue Dogs age 8 and older are $400. International Rescue Dogs will have an additional $400 transport fee. Adoption fees are subject to change without notice. The Rescue Dog will have been neutered or spayed, given all necessary inoculations including a rabies vaccination, heartworm tested, stool tested for parasites, and given any other necessary treatment prior to adoption. Tattooing All YGRR dogs will be microchipped for identification purposes. Return Policy If, for any reason is not satisfactory for the YGRR dog or the adoptive owner, YGRR requires that the dog be returned to YGRR.The Rescue dog cannot legally be sold or given away. YGRR reserves the right to take back any Rescue dog neglected, improperly cared for, or allowed to run free unsupervised. Agreement The adoptive owner must sign a Adoption Contract (Release and Indemnity Agreement) to protect him / herself, Yankee Golden Retriever Rescue, Inc. and the Rescue dog be subject to all the conditions and stipulations contained therein. License The Rescue dog must be licensed in accordance with the existing laws in the adoptive owner's town, and the rabies vaccine must be kept current. Care The adoptive owner agrees to provide proper shelter, food, medical care, and agrees that the Rescue dog will not be maintained as an outdoor dog or run free without supervision. Failure to comply with these terms will require that the Rescue dog be returned to YGRR. We require that you follow a regular inoculation program established by your veterinarian. You dog will need yearly boosters or titers for distemper and parvo virus, and a rabies booster in accordance with the state or local regulations. Your dog must have an annual heartworm test and your veterinarian will recommend a preventative heartworm program which must be implemented. I have read the "Terms of Adoption" and I understand and agree to abide by them if I adopt a Golden Retriever from Yankee Golden Retriever Rescue, Inc. I am willing to have a YGRR representative visit my home by appointment prior to adoption.